Karina's Kreations: Star of Light Fancy Fold Card! Star of Light Fancy Fold Card! Hi Stamping Friends, I made an elegant fancy fold card using the Star of Light stamp set and coordinating Starlight Thinlit Dies. You can buy these as a bundle and save 10% #143508. The stamp set has 9 different greetings perfect for all you holiday cards. Instead of using an embossing folder, I used Fancy Frost Specialty Designer Series Paper #142012. It comes with 6 different textured designs. Behind the white star image, silver glimmer paper #135314 adds a little sparkle. 1. Cut Pool Party card stock to 5-1/2” x 8-1/2”. 3. Flip the card stock and repeat on the other side. 4. Make the inside score lines by scoring at 1-1/4”, 2-1/2”, 6” and 7-1/4”. 5. Make the outside score lines at 4-1/4” and 6-3/4”. 6. Fold up the card by making a mountain fold at the first fold, then a valley fold, mountain fold and valley fold. 7. The 4-1/4” outside line is a mountain fold and 6-3/4” line is a valley fold. 8. Cut 2 pieces of Fancy Frost designer paper at 4” x 5-1/4”. Line up the edge at ½” cut down to 3”. Flip the paper and repeat. Cut out the middle by lining the edge up at 1”. 9. Repeat the cuts with the second piece of designer series paper and attach to the card. 10. 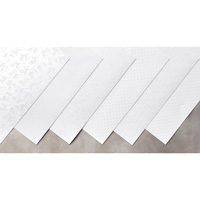 Cut 1” x 3-3/4” Fancy Frost Designer Series Paper and attach to the card. 11. 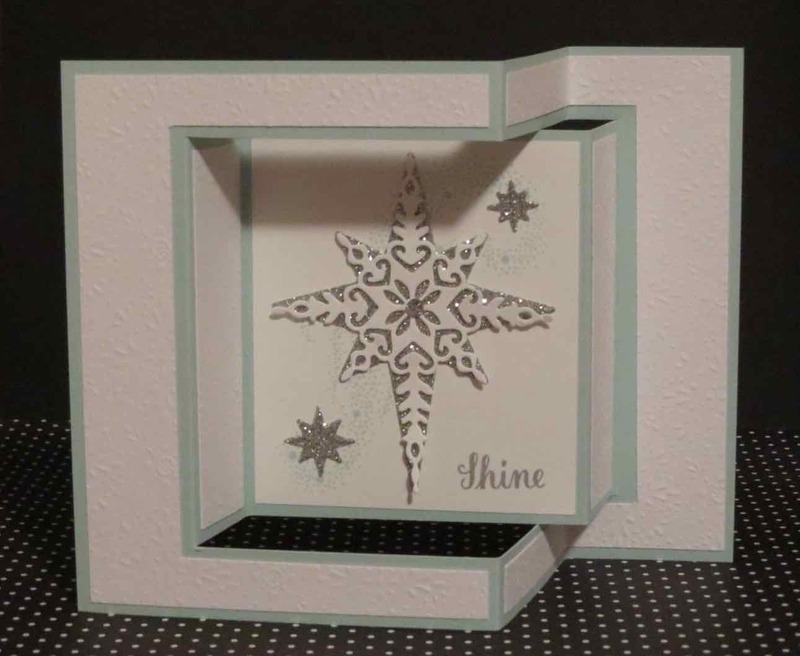 Attach 3-1/4” x 3-3/4” Whisper White card stock to the center of the card. 12. Stamp Shine with Smoky Slate ink. 13. 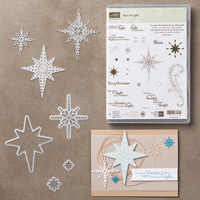 Cut out the star images from Silver Glimmer paper and Whisper White card stock.